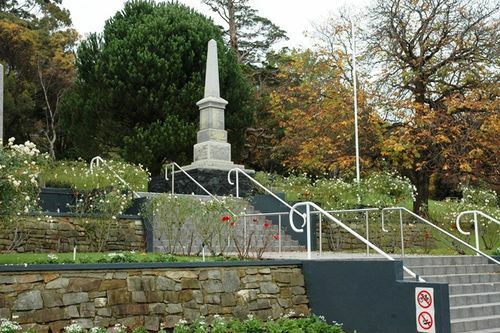 A memorial commemorates those who died or were killed in World War One. Money was raised by the Fallen Soldiers` Memorial Committee to construct the monument. An important event in the history of Burnie eventuated yesterday afternoon, when a memorial to commemorate the memory of district soldiers who laid down their lives in the Great War was unveiled. The ceremony was a most impressive one, and the earnest words that were spoken should long be remembered by all who were present. The monument itself is a granite obelisk. The foundations are of columnar basalt, obtained from the quarry in the vicinity of the Burnie wharves. It is interesting to note that there are very few places in the world where rock of this formation has been found. To the memory of a great company of young men belonging to this District who fighting in defence of the Empire laid down their lives in the Great War 1914 - 1918. The citizend of the Emu Bay Municipality erect this stone of remembrance A.D. 1923.